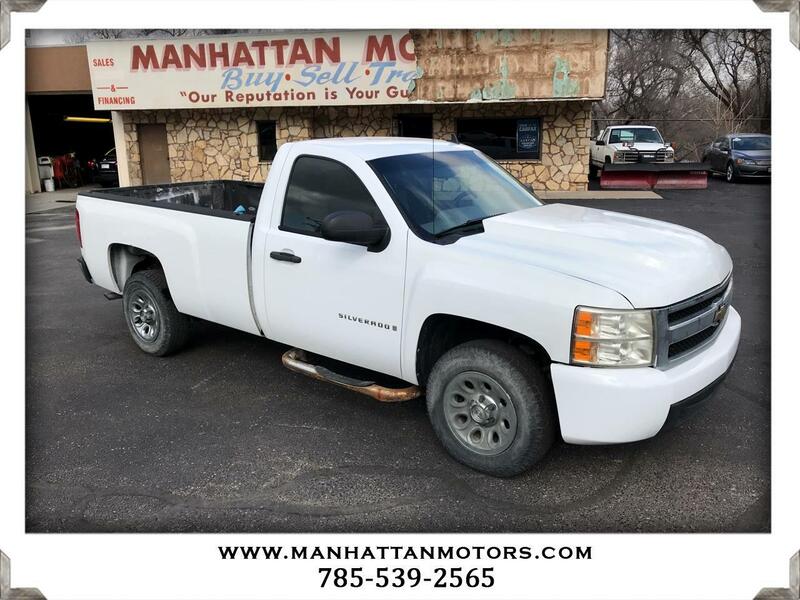 Meet our Accident Free 2007 Chevrolet Silverado 1500 Work Truck Regular Cab 4X2 in Summit White that is the pick of the litter if you're in the market for a full-size work truck. Fueled by a 4.8 Liter V8 that delivers 285hp and all the power you need to get the job done while connected to a durable 4 Speed Automatic transmission! This Rear Wheel Drive combination will get you near 23mpg on the open road. The exterior is enhanced by a chrome grille, prominent wheels, chrome tubular side steps, a bedliner, and a trailer hitch receiver. Inside our Work Truck, driver and riders will appreciate durable seating, a handy driver information center, automatic headlights, air conditioning, and more. Choose the tunes that motivate you on the excellent AM/FM/CD audio system with auxiliary input, and get going! Chevrolet includes substantial safety equipment, including four-wheel ABS, daytime running lights, tire pressure monitoring, available OnStar, and dual airbags. Get the job done and keep everyone secure while doing it. This full-size pickup is durable and versatile, with looks and features to match. Our Silverado has what it takes to get a trailer in place or a load of cargo toted in style. Print this page and call us Now... We Know You Will Enjoy Your Test Drive Towards Ownership! Thanks for choosing Manhattan Motors. We recently won The Manhattan Mercury Readers' Choice Award for being the #1 Used Car Dealer. Buyers enjoy our "laid back" approach. No test drive routes or high-pressure salesmen. Our focus is to offer all of the information you need to help make the best decision for your family or business. Each one of our vehicles undergoes a 30-point vehicle inspection by Burnett Automotive, Manhattan's #1 Auto Service Facility. We are also the area's only Independent USAA Certified Dealer, offering discounts on purchases and interest rates.